Within 250 miles of League City, TX. At this high performance freestyle swim clinic, your swimmer will learn how to get more out of every stroke, achieve the right tempo to maximize speed, and stroke techniques to DROP TIME in every race from the 50 to the mile! Don’t miss out on this opportunity to learn from Olympic gold medalist Clark Smith who specializes in teaching essential components of racing fast! Take advantage of Early Bird Pricing! Sign up before prices rise! Clark Smith will lead two sessions designed for competitive swimmers of all ages and ability levels. There will also be a special parent’s talk from Olympic parent Eddie Adams at the beginning of each session. Did you know that the technique for swimming a fast freestyle changes depending on the distance? Learning how to prioritize tempo vs. length and speed vs. efficiency can make a big difference in maximizing speed in shorter races or increasing endurance in longer races. Arm Pull: Both distance and sprint freestyle strokes should have a long extension and powerful finish, but finding the sweet spot for the right tempo for your swimmer can be difficult. Learn from Clark Smith tips and tricks to get more power out of every arm pull while also achieving the tempo that will help them drop time. Kick: The technique AND the timing in the freestyle kick is SO important! In every race, the kick must connect to the rest of the stroke! Learn how to maximize the speed of every kick! Rotation: What is the driving force behind rotaiton, hips or shoulders? The answer depends on the race you're swimming! Learn when to have a hip driven rotation and when to have a shoulder driven rotation so that your swimmer can race a faster freestyle no matter what distance they're swimming. 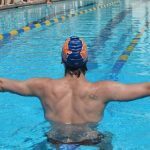 Breath: Both the technique and timing of the breath can have a big impact on a swimmer's freestyle speed. Your swimmer will learn how to maintain a quick and low breath to maintain momentum during the breath stroke. Clark Smith will also work with each swimmer to learn about the right number of breaths in each race! Does your swimmer count their strokes? They should! Knowing how many strokes that they take each lap in every strokes is important to knowing how far each stroke takes them so that they can work on improving their length. Olympic gold medalist Clark Smith will work with each swimmer to find ways to get more power and length out of every stroke to improve their DPS and DROP TIME! Swimmers and parents are invited to ask Clark Smith questions during a Q&A session. Gain insight into his training regimen, diet and nutrition, and recovery tactics. Observe Clark Smith swim at full speed and demonstrate a progression of perfectly executed drills to achieve powerful, efficient and fast swimming.